LastPass is a password manager that securely stores your passwords and personal information in a secure vault. As you visit apps and sites, LastPass autofills your login credentials. All you have to do is remember your LastPass master password, and LastPass will autofill logins for you. Stop getting locked out of your online accounts or struggling with frustrating password resets. Let LastPass remember your passwords for you, and keep you safe online. NEW TO LASTPASS? Download LastPass now and get the protection you need for your online information. You can use LastPass across all your devices, including phones, tablets, and personal computers, for free. 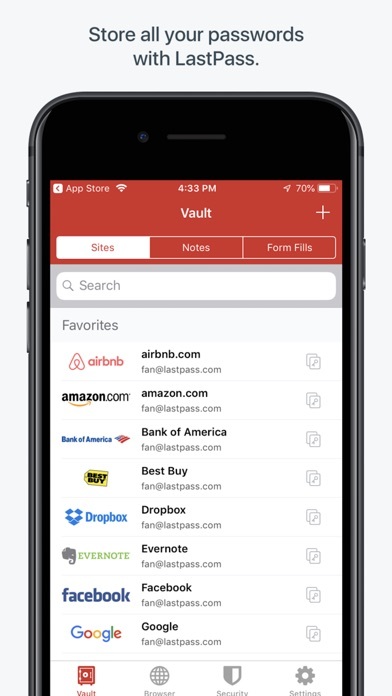 -	Store usernames and passwords for all of your online accounts securely in your LastPass encrypted vault. 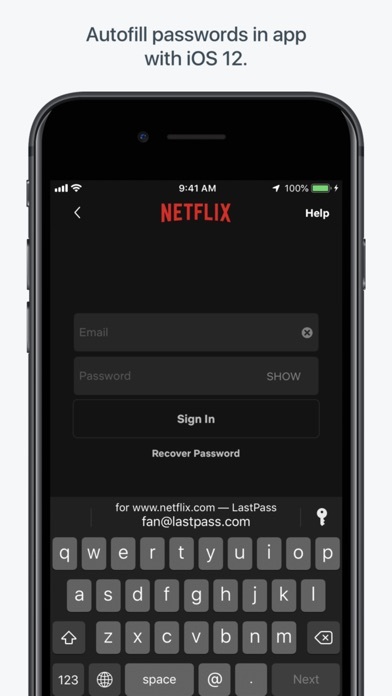 -	With the release of iOS 12, LastPass can now autofill in-app. Simply launch your apps and LastPass will fill in your username and password. -	Autofill usernames and passwords seamlessly in Safari and other mobile browsers. -	With free syncing, anything you save on one device is instantly available on all other devices. -	Securely store information like credit card numbers and health insurance cards in the encrypted vault. -	Log in with your fingerprint for simple, secure access to everything in LastPass. -	Safely and conveniently share passwords with others, such as the cable login or WiFi password. -	Create secure passwords in one click with the built-in password generator. -	Multi-factor authentication secures your password vault to add a second layer of protection on your account. LastPass never has the key to your encrypted data, so your information is available to you, and only you. Your vault is encrypted with bank-level, AES 256-bit encryption. 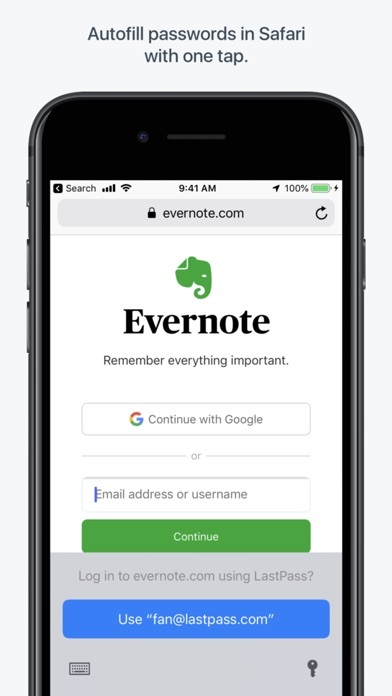 Get more with LastPass Premium: - Unlimited sharing of passwords, items and notes - 1GB encrypted file storage - Premium multi-factor authentication like YubiKey - Priority tech support - Desktop fingerprint authentication Your subscription will renew automatically every year and payment will be charged to your iTunes Account within 24 hours prior to the end of the current period. Subscription automatically renews unless auto-renew is turned off at least 24-hours before the end of the current period. Any unused portion of a free trial period will be forfeited when you purchase a subscription. You can turn off auto-renewal by going to your Account Settings after purchase. No cancellation of your subscription is allowed during the active subscription period. 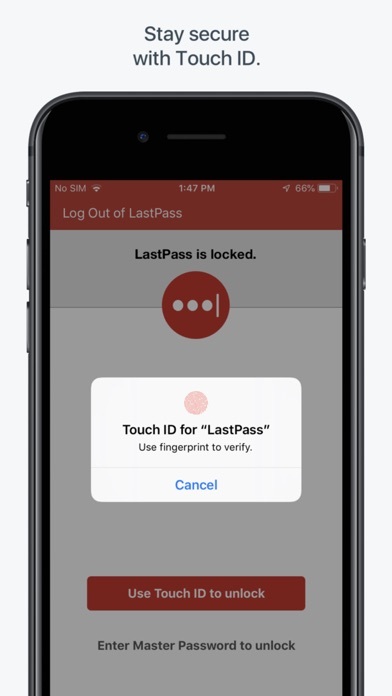 Terms of service: https://www.logmeininc.com/legal/terms-and-conditions Download LastPass today for simple, secure access to your passwords! Ive been a long term user and they have Tripled my price in that time. Now its $36/yr with no option for lifetime. So I exported my passwords and bought a lifetime sub to StickyPasswords for less than the cost of 2yrs of LP. Bye. I’ve been looking for an app like this, and this is better than what I wanted!!!!!!!! Can be glitchy in recognizing fields and filling them. The synchronization between mobile and desktop platforms is outstanding. I concur with other reviews citing bad customer support. It's an arduously absurd process of support tickets and cut and paste responses from techs who ought to provide responsive answers. Recommend the the most part. Now can reset password on phone. Soon the product will be so convenient there will be no security left. This has worked correctly for years. Now copies the password with no Face ID. Leo Laporte, whats the deal? Why would you recommend such a cumbersome inadequate app? It’s reminiscent of old Windows 98 programs when in a Windows 10 environment. This app fails to do what it says, it generates hard passwords then it forgets them for you the next time you visit the site. It cause more head ache and waste more time than if I used a note pad. Don’t waste your money on this app, I should of suspected when they only give ya the yearly option. More than anything, I’m disappointed with Clear Channels The Tech Guy, Leo Laporte. He should know better than not to recommend the best app available? Last Pass is not the best, it may be the worst. All I have been able to accomplish is getting to the site.. I need to input the pw... It does work across platforms, which IS a help. A Great App! Better than apples auto system. This app is top notch. THE BEST Password App that I have Tried to date. At first I was intimidated buy it’s sophistication. What I like the most is that it’s Security Software leaves very little room for Error. FURTHERMORE I have no problems with it copying usernames and especially the Pass Code. All others i Have Tried won’t do it BZ BZ BZ BZ (Bravo Zulu) GREAT JOB GUYS!!!! When it works I love it, but can't give them many stars because at one point it updated and then told me my master password was wrong. It would not allow me to log in with my fingerprint on my iPhone either, so Ilost all my passwords for a week. I couldn't access anything. I couldn't get in touch with customer service for days. Eventually I did talk to customer service, but they insisted I must not be entering the right password. Suddenly days after it stopped working, on a whim, I tried the same master password I had tried dozens of times the week before, and it worked again. I was able to retrieve my passwords and change my settings so I wouldn't get locked out again. Customer service had me convinced I didn't know my own master password until it suddenly worked again. I'm pretty sure the update screwed something up which they later fixed, but it was a pretty difficult week without passwords.